When I was a kid, just about the only supernatural you could find a story about was a witch. I loved reading stories about witches, drawing witches, playing witches on the playground. I thought that was the coolest thing, to be able to cast spells and fly and have a cat (we were a dog family). But lately, it doesn’t seem that witches are cool enough. Even the wand-wielders in Harry Potter were wizards, not witches. So imagine my excitement when I got the opportunity to read a new book about a girl who finds out that she, herself is not only a witch, but is a descendant of a Salem witch? Ahhh. I settled in to read on a grey, stormy day and was pulled into the story of Abby Silva of Ipswich, Mass. Just a stone’s throw from Salem (the town, not the cat from Sabrina the Teenage Witch). Abby feels like an outsider in her own family. Her brother and father favor their Portuguese roots, while Abby is 100% like her mom. It wouldn’t matter so much, but since her mom died when she was eleven, she just looks like she doesn’t belong. Tall, pale, blond. The frequent nightmares and painful headaches don’t help, either. Then there’s the incident with the traffic cone when she’s trying to parallel park at her driver’s test. She wants to pass the test, the cone appears to be too far away…she wants it to move…then it does. Just enough. Is she losing her mind? Things seem to be happening for Abby. She easily finds a job in Salem, she always finds a parking spot when she needs one, and she keeps running into Rem, the cute boy with the strange eyes. Eyes she’s seen before…in a dream. But Abby’s eyes are only for Travis Brown, a sweet, perfect, popular guy that she has known (and had a crush on) since elementary school. But he is with Megan Keith, mean girl supreme at Ipswich High School. He’ll never think of Abby that way…or can she do something about that? It seems that she has magical abilities, and when she finds a centuries-old spellbook in her purse, shouldn’t she find out what she really can do? But why does she find herself thinking of Rem more than Travis? And why does it seem that Rem is interested one minute, and not the next? Her discovery may lead her to righting a wrong that could destroy Salem completely. The Bottom Line: A fun tale that invokes some old-school witchcraft, brings in the creepiness of Salem’s history and adds a sprinkle of attraction. There are some unanswered questions about why this witchy heritage was never discussed by her family, and some of the action could have reached higher heights. Things seemed to right themselves easily, too. But maybe that’s Abby’s magic at work. 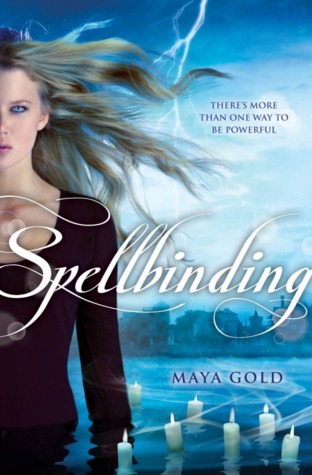 Spellbinding by Maya Gold was published April 1, 21013 by Point. A free copy of this book was given to Ink and Page in return for an honest review. Big thanks to NetGalley/the Publisher/the Author. WHEN DOES THE MOVIE COME OUT???????????? According to IMDb.com, there is no movie announced.